-1942- April 1942 May 1942 The W.C.T.U met Apr. 21 with Ada Park. Mrs. Mitchell presided. Mrs. Watland had the devotions. At the business we read the names of the paid up members, and put a check mark ✓ by the names of each. Nellie Lincoln read an item about comics. We voted to send a condolence card to A.M. Burton and to Miss Grace Burton (one card) on the death of their stepmother Mrs. Teresa Wright Burton, (Mrs. P.D.) Ada Park Sec. May 19 -1942- Met with Mrs. Aldace Child Mrs. Mitchell presided. She reported on the health of absent members. Song - Praise God from where all blessings Flow, and America. The topic - Temperance and missions. Told that a boy had been sent to Josie [Vanderbinden?] by her parents. Also she told of a meeting of the Oskaloosa WCTU at which the state meeting at Shenandoah was reported. Devotions were by Ada Park who displayed a picture of mother Benedict and talked about her life. Mrs. Murray said 3 papers were signed in the Methodist Church Sunday, 1 to President R. 1 to Herring, and 1 to somebody else. Mrs. Mitchell suggested our quilt to Benedict Home [aught?] to take the place of barrel of fruit. Asks us to bring to the July mtg. our special money for our work. Asks us to take home penny boxes. Mrs. Child served dainty refreshment. Ada Park Sec. PS. Rev. Evans told of Howard Hamlin asst. educational director who does wonder to make ohio [dry?]. no this was in May 1943. SOCIETY W.C.T.U. WILL MEET W.C.T.U. will meet Tuesday afternoon, May 19, at 2:30 with Mrs. A. W. Child, 1120 West street. W.C.T.U. 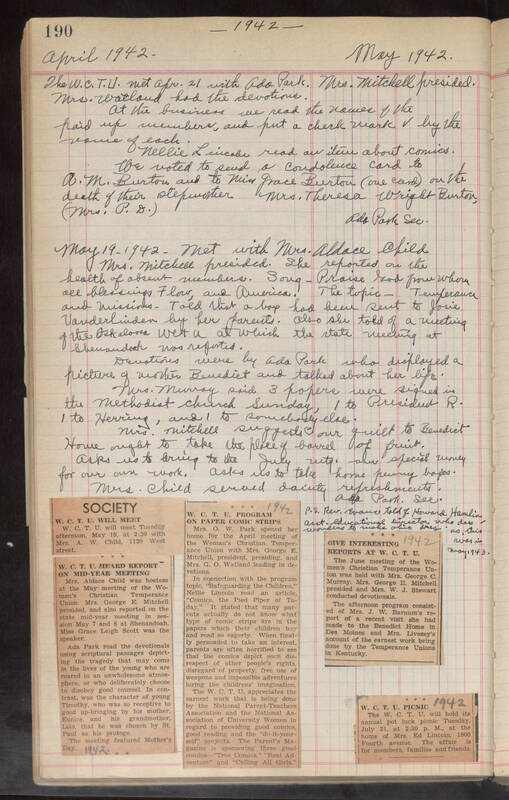 HEARD REPORT ON MID-YEAR MEETING Mrs. Aldace Child was hostess at the May meeting of the Women's Christian Temperance Union. Mrs. George E. Mitchell presided, and also reported on the state mid-year meeting in the session May 7 and 8 at Shenandoah. Miss Grace Leigh Scott was the speaker. Ada Park read the devotionals using scriptural passages depicting the tragedy that may come in the lives of the young who are reared in an unwholesome atmosphere, or who deliberately choose to disobey good council. In contrast, was the character of young Timothy, who was so receptive to good up-bringing by his mother, Eunice, and his grandmother, Lois, that he was chosen by St. Paul as his protege. The meeting featured Mother's Day. 1942 1942 W.C.T.U. PROGRAM ON PAPER COMIC STRIPS Mrs. O. W. Park opened her home for the April meeting of the Woman's Christian Temperance Union with Mrs. George E. Mitchell, president, presiding, and Mrs. G. O. Watland leading in devotions. In connection with the program topic, "Safeguarding the Children," Nellie Lincoln read an article, "Comics, the Pied Piper of Today." It stated that many parents actually do not know what type of comic strips are in the papers which their children buy and read so eagerly. When finally persuaded to take an interest, parents are often horrified to see that the comics depict such disrespect of other people's rights, disregard of property, free use of weapons and impossible adventures luring the childrens' imagination. The W.C.T.U. appreciates the earnest work that is being done by the National Parent-Teachers Association and the National Association of University Women in regard to providing good comics, good reading and "do-it-yourself" projects. The Parent's Magazine is sponsoring three good comics—"True Comics," "Real Adventure" and "Calling All Girls." 1942 GIVE INTERESTING REPORTS AT W.C.T.U. The June meeting of the Women's Christian Temperance Union was held with Mrs. George C. Murray. Mrs. George E. Mitchell presided and Mrs. W. J. Stewart conducted devotionals. The afternoon program consisted of Mrs. J. W. Barnum's report of a recent visit she had made to the Benedict Home in Des Moines and Mrs. Livezey's account of the earnest work being done by the Temperance Unions in Kentucky. 1942 W.C.T.U. PICNIC The W.C.T.U. will hold its annual pot luck picnic Tuesday, July 21, at 2:30 p. M. at the home of Mrs. Ed Lincoln, 1900 Fourth Avenue. The affair is for members, families and friends.